Denise Bean-Raymond brings 23 years of teaching experience to her Hunt Seat lesson program. She is available to teach those that own their own horses. 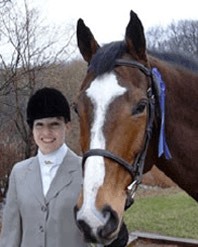 She is licensed in the state of Massachusetts, as well as certified Nationally with the American Riding Instructorʼs Association. There are currently less than one dozen people in her respective state that hold her specific A.R.I.A. Hunt Seat certification. She has competed throughout the Eastern seaboard in numerous events, and has trained with top professional hunter/jumper riders throughout her career. Her lessons are skillfully tailored to each individual riderʼs needs, goals and learning style. She teaches in a positive, thorough, dedicated manner that promotes confidence amongst her students. Those interested in lessoning with Denise are always welcome to observe her teaching. Please contact Denise to schedule an appointment. Riding lessons are 45 minutes in duration. Lessons are private and include horse safety, grooming, tacking/untacking and riding time. Rates page for additional information. All lessons are pre-paid. Payment via cash, credit card, or check must be made UPON ARRIVAL of the instructor. If payment is not made at this time, there will be NO lessons rendered. There are absolutely no exceptions to this policy. Thank you for your understanding and cooperation in advance.